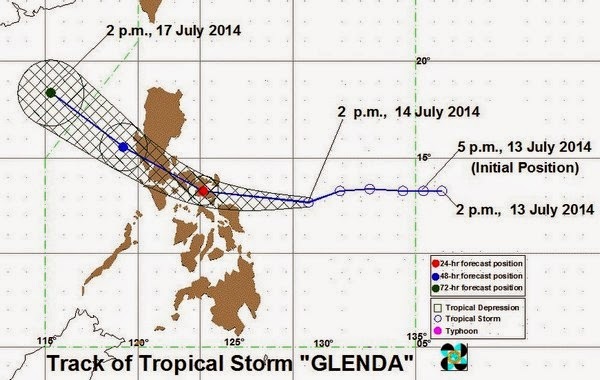 On this page you'll find updates on Bagyong Glenda, a tropical storm, based on PAGASA weather forecast as of Monday, July 14, 2014. At 4pm, TS Glenda (international name: Rammasun) has been spotted at 470 kilometers East Southeast of Virac, Catanduanes or 500 km East of Legazpi City, Albay with maximum sustained winds of 110 kilometers per hour near the center and gustiness of up to 140 kph. Bagyong Glenda has intensified further as it continues to move westward threatening the Bicol region, the state weather bureau posted. It is forecast to move West at 30 kph. Earlier, state weather forecasters said the estimated rainfall amount is from 7.5 to 15 millimeters per hour (moderate to heavy) within the 400-km diameter of the storm. Fishing boats and other small seacrafts are advised not to venture out into the Eastern seaboards of Luzon and of Visayas. The weather bureau advised the public and the Disaster Risk Reduction and Management Council (DRRMC) in affected areas to take appropriate actions and watch out for the next bulletin. Bagyong Glenda is expected to be in the vicinity of Ligao City, Albay by Tuesday afternoon and at 90 km West Northwest of Iba, Zambales by Wednesday afternoon. By Thursday morning, it is expected to be 500 km West of Laoag City, Ilocos Norte, PAGASA added.